Castel Sant'Angelo, sometimes referred to as the Mausoleum of Hadrian, is a towering cylindrical mausoleum commisioned by Hadrian during the 2nd century as a mausoleum for himself and his family, patterned after the Mausoleum of Augustus. The building was later used by the popes as a castle for protection, and has been used as a prison and a papal residence, and is now a museum. Originally, the tomb was a decorated cylinder with a golden quandriga driven by Hadrian on the top. Hadrian's ashes were put here after his death, along with his wife and son. Succeeding emperors were interred here as well, the last being Caracella in 217 AD. The ashes of these burials were placed in the Treasury room deep within the building, but much of the tomb contents and decorations have been lost since the building's conversion to a military fortress and its inclusion into the Aurelian Wall of Rome in 275 AD. The urns and ashes were scattered by the attacking Goths in 537 AD. The popes converted the structure into a castle, beginning in the 14th century, connecting it to the Vatican with the Passetto di Borgo. 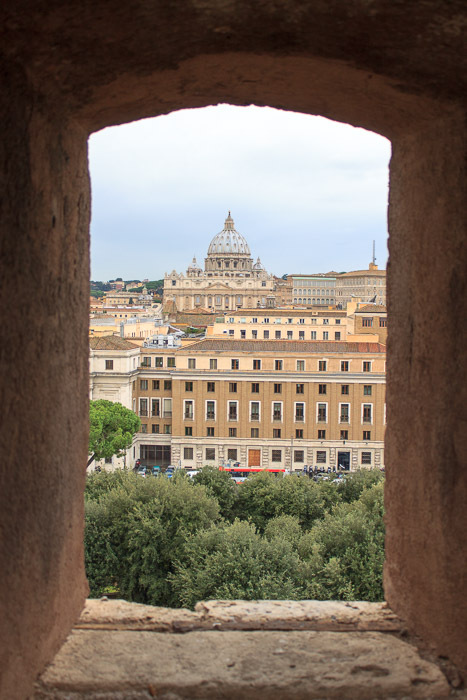 During the sack of Rome in 1527, Pope Clement VII and his Swiss Guard fled the Vatican using the Passetto to the Castel Sant'Angelo for protection. A bronze sculpture of archangel Michael (4th photo below) by the 18th century Flemish sculptor Pieter Verschaffelt now stands at the top of the castle. 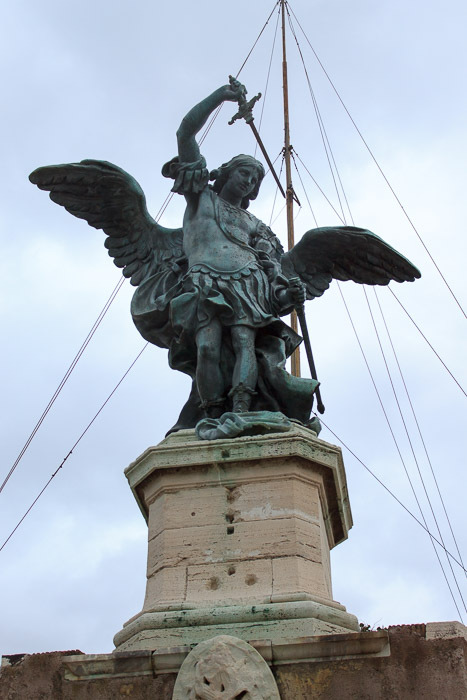 It replaces the marble version of the archangel Michael who, according to legend, appeared on top of the fortress in 590 AD and miraculously ended the severe plague that had infested the city of Rome. 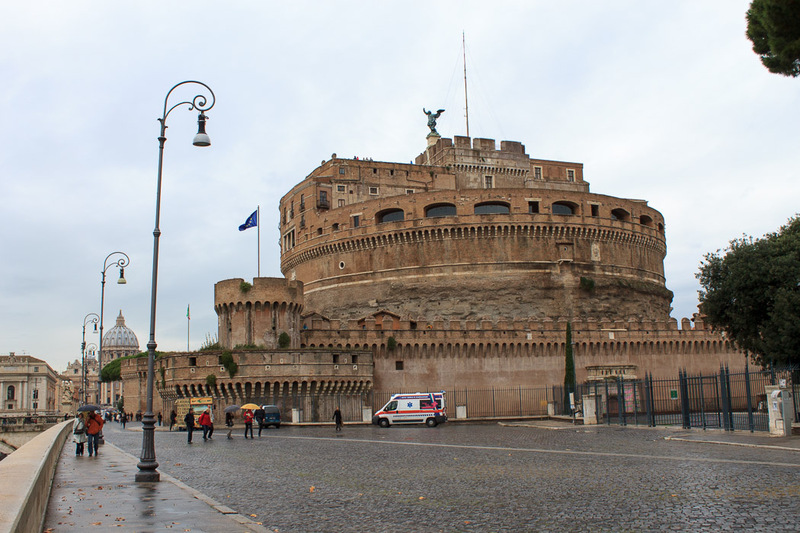 After that event, the building was renamed Castel Sant'Angelo in honor of the archangel. The castle appeared in the film Roman Holiday and was featured in Puccini's opera Tosca and Dan Brown's 2000 novel Angels and Demons. Today, the National Museum of the Castel Sant'Angelo retraces the building's history, displaying Renaissance paintings and pottery and antique military weapons. The papal apartments feature beautiful rooms with many frescoes. Below the apartments are several floors which include prisons and even a torture chamber. A huge spiral ramp (3rd photo below) ascends 400 feet into the Castel Sant'Angelo taking tourists from the ground level into the historical parts of the building. I missed it, but somewhere along this ramp (probably neat the top end) is the 25-foot-square imperial tomb, with two windows, where the urns would have stood in the center. The castle is connected to the city at the other side of the Tiber River by the Ponte Sant'Angelo, to which statues sculpted by Bernini and his workshop were added during the Renaissance. 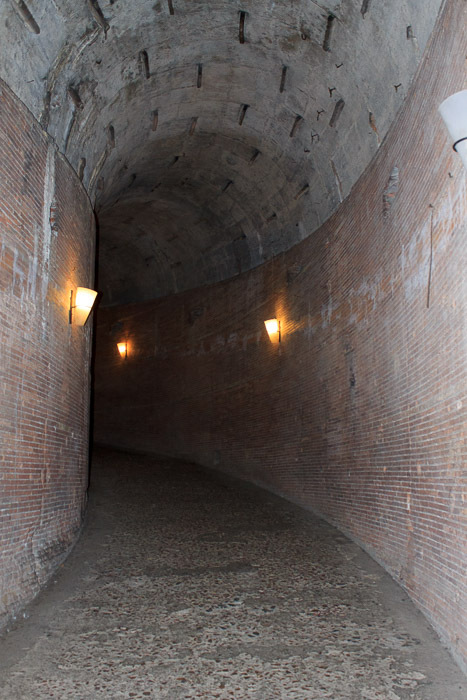 See all Castel Sant'Angelo photos.